The differences between green and standard burials are in the non-invasive, eco-friendly methods used to care for the body prior to and during burial, not in the ways we honor our dead. Green burial is a way of caring for the dead with minimal environmental impact that aids in the conservation of natural resources, reduction of carbon emissions, protection of worker health, and the restoration and/or preservation of habitat. The standard conventional funeral, complete with embalming and burial in a lawn cemetery, is fraught with health hazards. It requires the permanent installation of non-biodegradable vaults around non-biodegradable caskets. Embalmers have an eight times higher risk of contracting blood diseases such as leukemia, and three times higher risk of amyotrophic lateral sclerosis (ALS), while groundskeepers are more than twice as likely to develop Chronic Obstructive Pulmonary Disease (COPD); both are exposed routinely to chemicals known to cause cancer and neurological diseases. And each year, the US buries over 1.6 million tons of reinforced concrete – roughly 1-2 tons per vault, plus imported steel from China and exotic woods from rainforests in South America, creating a significant total of carbon emissions. The differences between green and standard burials are in the non-invasive, eco-friendly methods used to care for the body prior to and during burial, not in the ways we honor our dead. In fact, rituals are on the rise as families find the natural setting of green burials conducive to both traditional and spontaneous celebrations of life and acknowledgment of their loss. Green burial cemeteries have many shared practices regardless of their type or governing structure. For instance, they limit the use of electrical or gas powered equipment, such as mowers and weed whackers and fertilizers, pesticides, herbicides. Green cemeteries are more like to use natural grave markers such as local wood or large stones, and have native plants that encourage habitat for birds, bees, and animals. The simple answer is that anyone might want this option, including people from spiritual traditions with uninterrupted vaultless burial practices. A more accurate description might be that green burial appeals to anyone who desires an exit that is in line with the way they have lived their life, what they valued, and what they believe to be authentic to their experience. 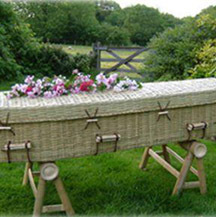 Green burial transcends issues of money, race, and economic, or social status. It is truly universal. Embalmers have an eight times higher risk of contracting blood diseases such as leukemia, and three times higher risk of amyotrophic lateral sclerosis (ALS), after having been exposed routinely to chemicals known to cause cancer and neurological diseases. Green cemetery plot pricing varies and is usually dependent on the going market price in any particular area. While the costs to consumers vary greatly with regard to purchasing funeral related items such as caskets and vaults, green cemeteries face similar challenges to conventional in cemetery operating. However, some green burial cemeteries work hard to keep the price affordable as part of their sustainable ethic. It is wise to contact the cemetery you are considering for the most up to date pricing information.